It may just look like an enormous, flying spider web towed behind a helicopter, but the ZTEM airborne geophysical survey system has the potential to identify giant porphyry copper deposits and features of other large ore deposits up to 2000 meters below the surface. Z‐Tipper Axis Electromagnetic (ZTEM) is an airborne electromagnetic survey system which detects anomalies in the earth’s natural magnetic field. These disruptions are caused by zones of rock that conduct or resist electrical current more than the surrounding rock, like ore deposits. The proprietary technology belongs to Canadian company, Geotech, who have flown over 250,000 line-kilometres with ZTEM in under 4 years. Geotech Ltd. is a Canadian airborne geophysical survey company that began operations in 1982. The company developed the now well-known VTEM (the versatile time-domain electromagnetic) system in 2002. The helicopter version of the airborne Z‐Tipper Axis Electromagnetic (ZTEM) system was introduced into commercial service by Geotech in 2006-2007, and the less-expensive fixed-wing (FW ZTEM) system was introduced in 2010-11. 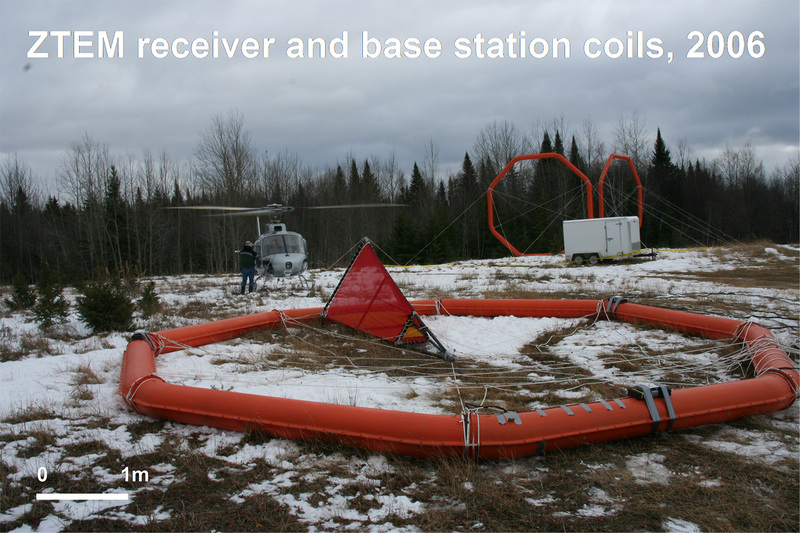 Figure 3: ZTEM z-axis receiver (foreground) and ground-based prototype reference coils (background) from field tests in northern Ontario CAN in 2006 (after Thompson et al., 2007). ZTEM is a type of electromagnetic (EM) survey to measure variations in the electrical properties of rocks. EM surveys try to identify bodies of rock that conduct electricity well, like massive sulfide bodies of copper or nickel ore, or rocks that resist carrying current more than their surrounds, like the silicic alteration found in the core of porphyry deposits. ZTEM surveys are different to other commercial EM systems because they measure variations in naturally-occurring EM fields rather than introducing an EM field into the ground and measuring the responding field, like VTEM. Instead, ZTEM measures variations in the naturally-occurring or passive magnetic fields produced by thunderstorms around the world. This magnetic field is planar – constant in all directions – but areas of highly conductive or very resistive rock will cause measurable disruptions. ZTEM surveys are designed to map resistivity contrasts to great depths, exceeding 1-2km, making ZTEM well-suited to finding porphyry-hosted and structurally-controlled exploration targets at depth. What does a ZTEM survey look like? 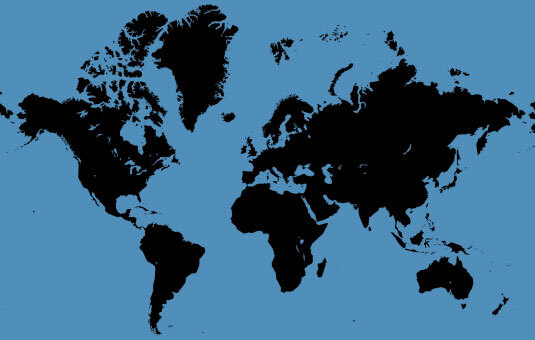 The ZTEM system is transportable, able to be packed into small units which can be shipped around the world. There are two key pieces of equipment to the system, an airborne loop and ground receivers. The airborne loops can be towed behind a helicopter or a fixed wing aircraft. The loop itself is a little over 7m across and looks a little like a giant, red-rimmed spider web. It is towed behind the aircraft at a height of around 100m above the ground to measure the vertical component of the magnetic field. A 75-90m cable attaches the loop to the aircraft. The cable separates the loop from the vibrations of the aircraft and transmits the collected information back to the receivers in the plane or helicopter. On the ground, base stations are set up in the survey area to measure variations in the horizontal magnetic fields. GPS receivers are used on the coil in the air and also on the ground to keep track of the orientation of each of the parts, with respect to each other and the earth’s magnetic field. 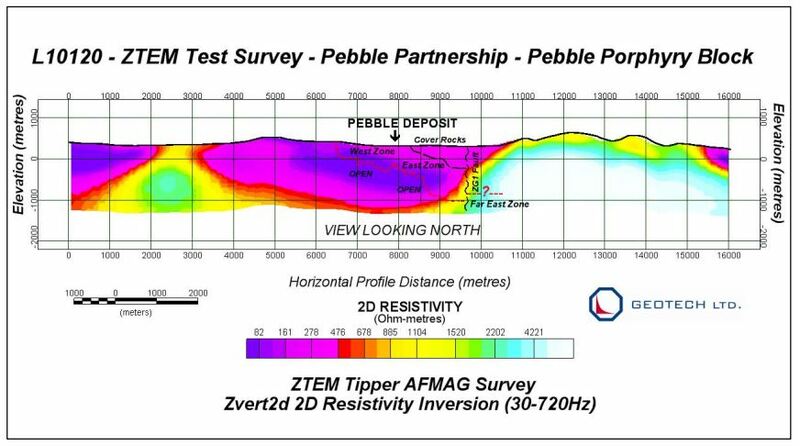 ZTEM was tested over a section of the world-class Pebble calc-alkalic copper-gold molybdenum porphyry deposit located in the Bristol Bay region of southwest Alaska in 2010. Some of the richest parts of the Pebble deposit are buried under up to 600 m of volcanic and sedimentary cover. With careful processing, ZTEM was able to identify several of the distinctive alteration haloes found around the porphyry deposits, with more detail at depth than other systems.